Plaza del Rossio (official name Praça de D. Pedro IV) is in the center of Lisbon, in the Baixa district, near Rossio train station. 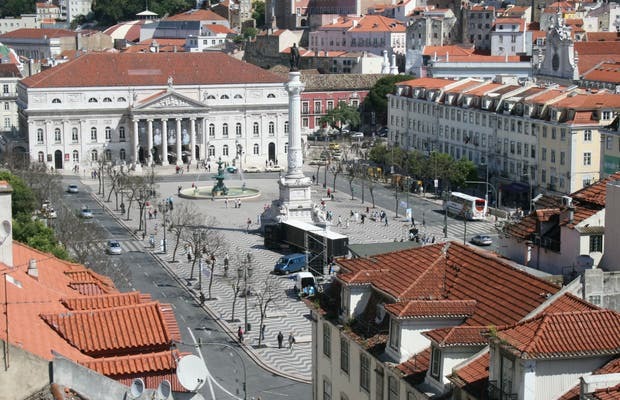 It's a medium sized square with two fountains and a monument to Don Pedro IV, King of Portugal, in the center. From the square you see the Santa Justa Elevator and Do Carmo Church and therein lies the National Theatre Dona Maria. An evening walk to Rossio Square, after stopping to observe the Santa Justa elevator, is a great pleasure that we completed with a visit to the Rossio station with its gorgeous Manueline style facade. It contrasts with the modernity of the inside of the station. It’s a nice place to take a rest before being walking all day. Also is useful when you want to spread alone and you have to meet later in a place, is mostly near everything. Beautiful place to visit! In December at night, it has a big lit up tree. And it is near Baixa!!! If that plaza SC knew that or not they’ll as much money does they lose more Kong much I’ve been there I would’ve known.